Alexandra Legg is the 2019 recipient of the prestigious D & MV (Dawson and Margaret) McDonald Scholarship, valued at up to $20,000. Established in their memory in 2008, the scholarship supports Conservatorium of Music violin, viola or cello students to work with master musicians in the United Kingdom. Alexandra will depart for London in January, with plans to attend classes at the Royal College of Music in addition to concerts presented by the London Symphony and London Philharmonic orchestras. “This is going to be a significant step in my journey as a cellist, and I am excited to learn more about improving my technique and overall sound,” Alexandra said. “I hope to build strong connections with the teachers I study with and other students that will help me pursue my career in the future. “I am in the process of contacting three cello teachers - Raphael Wallfisch, Rebecca Gilliver and Natalie Clein. They are very experienced cellists and are unique in their different approaches, so I will be able to learn new things from each of them. The late Dawson and Margaret McDonald taught art at RMIT in Melbourne and had an enduring interest in music. Margaret’s mother, Stella Honey, played violin with the Tasmanian Symphony Orchestra (TSO) in its early years, encouraging the pair’s desire to assist up-and-coming local talent. 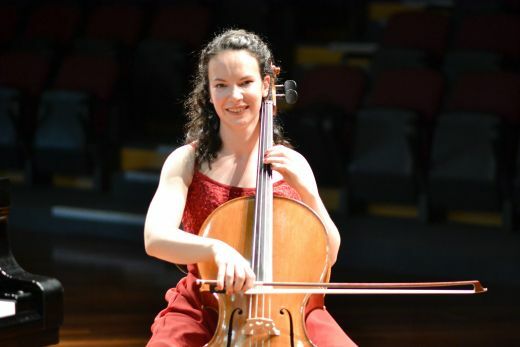 “The scholarship aims to provide critical experience and to develop excellence among young Tasmanian strings players,” Manager – Scholarships, Prizes and Academic Scheduling Chris Dillon said. Following three rounds of auditions, Alexandra will today (Monday, 5 November) be formally announced as the scholarship’s 11th recipient. She also sings in the Southern Gospel Choir, has played with the Tasmanian Youth Orchestra and the TSO, and holds an existing Conservatorium of Music scholarship. “Not only is this scholarship going to benefit me and my playing, but by bringing back what I have learnt to Tasmania, I have a great opportunity to enrich the musical culture of our state and the University. “In whatever small way I can, I just want to give back to my family, my friends and my State, and especially the donors of the amazing scholarship, anything and everything I can by way of saying ‘thank you’. “When I return from London I hope to study Honours at the Conservatorium, majoring in cello. I look forward to learning more from my teacher, Sue-Ellen Paulsen, the principal cellist of the Tasmanian Symphony Orchestra, who has pushed me and supported me incredibly over the last three years. I am extremely thankful for her guidance and friendship. Alexandra is in her last semester of a Bachelor of Music and will spend a total of 10 weeks studying in London.